Former Posh bosses Darren Ferguson (left) and Graham Westley (right). More evidence of Peterborough United being in safe hands, while chairman Darragh MacAnthony remains in charge, has emerged in the last couple of weeks. 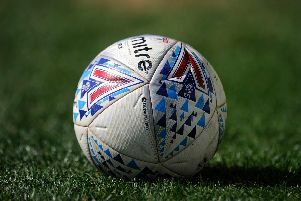 Indeed my round-up of recent events in the Football League will start with the relegations from League One of Swindon Town and Coventry City. Manager of the year Nigel Clough. 1) Bulk arrivals of loan players won’t work and if it does it will be a short-term measure. I warned Twitter trolls, and members of the press, of both Coventry and Swindon that gloating about play-off pushes would soon be followed by relegation laments. Players who perform well on loan disappear to bigger and better clubs soon enough, often leaving players of much lesser quality behind. There’s more to the demise of both clubs of course, but a terrible, near-sighted squad-building strategy hasn’t helped. 2) The late-season choke from Leeds United is no surprise. If you rely on one person to score all your goals, you will get found out soon enough. 3) If Newport County avoid relegation from the entire Football League it could well spell the end of Graham Westley’s career. I suspect Westley’s departure from a club is the mental equivalent of lead weights being taken from boots, of a dirty great black cloud disappearing from the stadium. Sadly it only lasted a fortnight at Posh. 4) I’m glad Newcastle United are back in the big time and if they back Rafa Benitez in the transfer market they will stay there comfortably. 5) Did you see that picture of Aston Villa players celebrating their win over Birmingham City last weekend? Villa are 12th in the Championship, the Blues are 21st. Villa have spent fortunes and have still failed miserably this season. Their players should be keeping a low profile even after beating their biggest rivals and nearest neighbours. 6) Free-scoring, Championship-bound Sheffield United are set to re-sign Ched Evans. Really? He’s been a rubbish League One player and hasn’t scored a goal since December. It’s a grotesque waste of money. 7) The crisis at Leyton Orient is another reason to be grateful for MacAnthony. Whoever carries out the ‘fit and proper owners’ test at the Football League should be receiving a P45. 8) I’m delighted to have Doncaster and Darren Ferguson back in League One. Less delighted that unlovely Wigan are back after a one season absence. They could be back to stay as well as they won’t have the advantage of Premiership parachute payments this time. Their next choice of manager is a huge one, but who trusts them to make the right move? Newcastle United manager Rafa Benitez. 9) Manager of the year in the Championship should be Burton Albion’s Nigel Clough. I didn’t expect Burton to pick up 20 points this season. Instead they survived far more easily than the likes of Nottingham Forest. Remarkable. 10) The play-offs are the greatest Football League invention of my lifetime. Just look at the battle for post-season action in League Two. Two games to go and 11 teams still have a chance.